When my mom makes dinner, she almost always makes a salad to go with the meal. A salad adds veggie servings and bulks up the meal to make you feel fuller. She is always so creative with her salads, and this one was one of my favorites when I went visiting a couple weeks ago. Hope you enjoy it as much as I do! Peel pears, remove cores and slice pears into fourths. Place slices in a large bowl and toss with the melted butter and sugar. Spread the slices on a baking sheet in a single layer. Roast about @10 minutes. Flip each slice over and roast @5 minutes longer. Watch so pears don’t burn. Whisk vinegar, shallot, oil, and salt&pepper to taste. 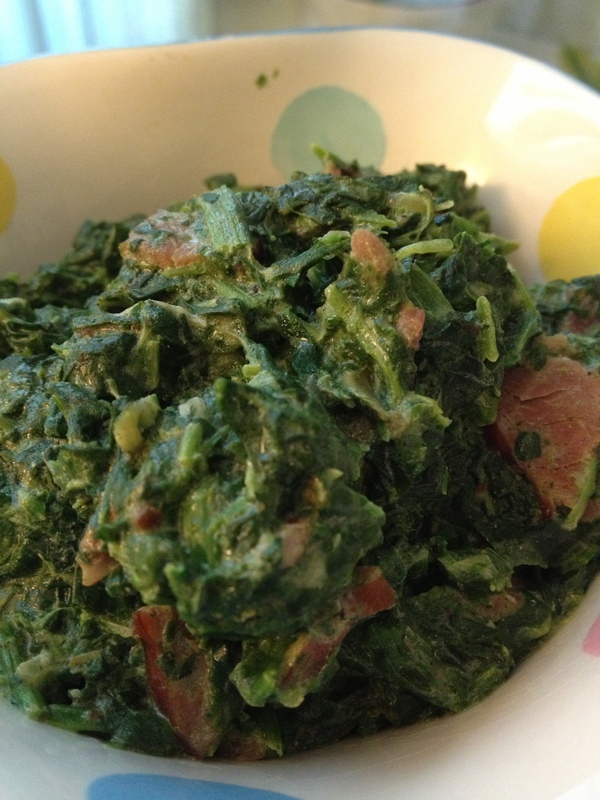 Combine watercress and salad greens in a large serving bowl. Gently toss with vinaigrette. To toast pecans: Place pecan halves in dry small skillet over medium heat. Shaking pan occasionally, toast for @1 or 2 minutes, until fragrant, careful not to burn pecans. 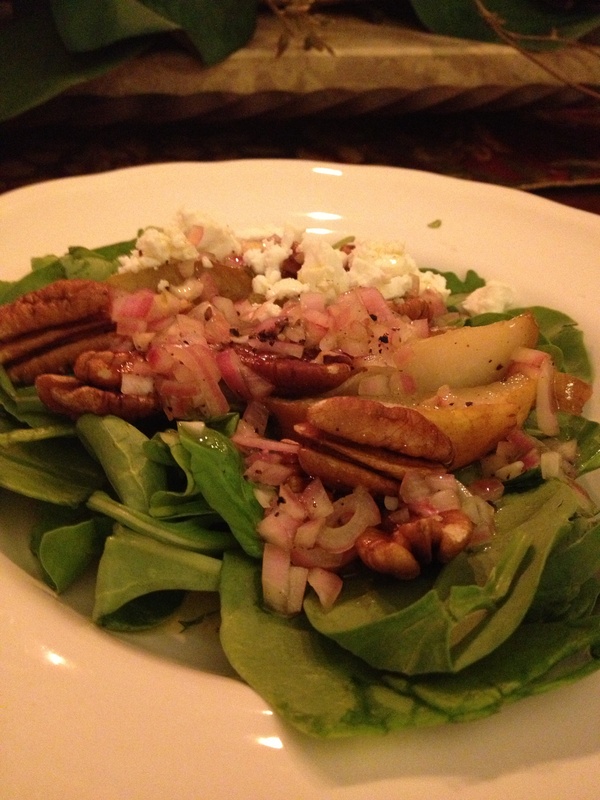 Plate onto salad plates and top with pears, pecans and blue cheese. In a deep saute pan over medium heat, stir the shallot and olive oil for about 3 minutes, until shallot starts to soften. Add the hot honey mustard and stir for another minute. Add the arborio rice and stir for one minute, just to toast and coat the rice. Add one cup chicken broth and stir. Continue to add the chicken broth, one half cup at a time and stirring, until the liquid is absorbed. It does require attention and stirring, but is worth it! 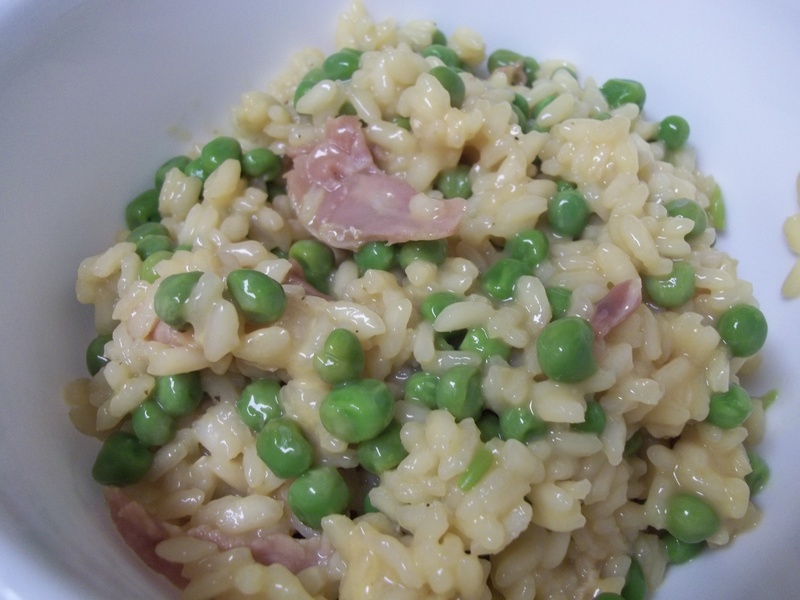 When almost all of the liquid is absorbed, add the peas and prosciutto and stir. Cover and let simmer about 3-4 minutes. Add the dill and salt and pepper. Give it a final stir and serve hot.